Following hot on the heels of Tuesday’s best and worst words, chosen for their signification, here are a best word and worst word chosen solely for their sounds. Clovis is an artist with a studio in Bushwick who paints monochromatic extreme close ups of people’s faces. I wish I had one to post here but alas it didn’t occur to me to ask. Take my word for it, though, they are really wonderful. 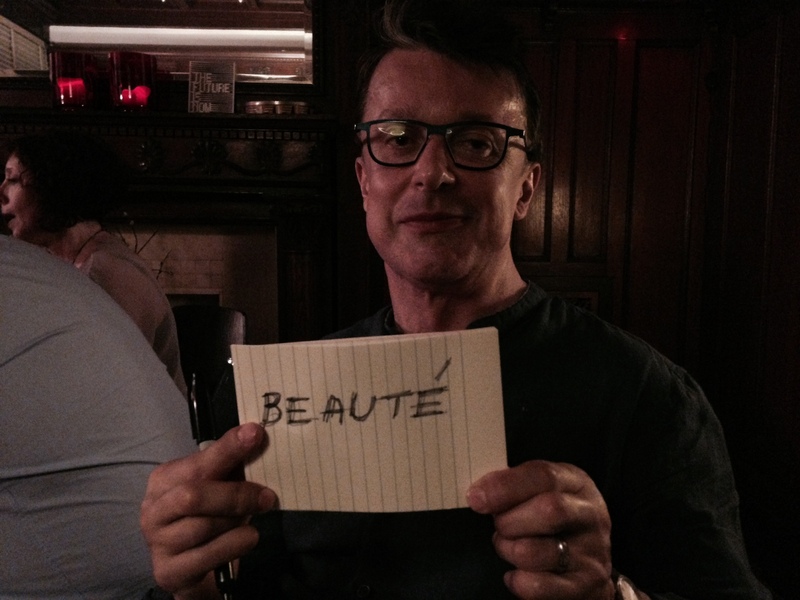 His favorite word, beauté (beauty), seemed a bit of an obvious choice until he explained why. It’s not the meaning of the word that he likes but the sound. “Parce que le mot est rond.” (“Because the word is round.”) Which is to say, he loves the word beauté for the word’s beauty. Clovis insisted that even if beauté actually meant something terrible like decrepitude or diarrhea (my examples, not his), he’d still love it. I see what he means – the four takes its time rolling off the tongue and then the ette erupts out at the end. It’s jarring. But I have to admit I like it – along with assiette (plate) and serviette (napkin). Why all the dinnerwear ending with ette? In any case… Clovis – whose work is all about color – told me that he thinks of words in terms of color as well. Synesthesia, I love it! “Some are hot colors and some are cold colors, and some I prefer more than others.” Since Clovis said beauté was hot and fourchette was cold, I guess he likes a warm palette (another ette word I love). Informal poll: fourchette, love it or hate it? Thomas is a novelist whose work I am excited to dive into. He assured me that I would be able to read it in the original French. He is also about to shoot a documentary about Bushwick artists, including Clovis, who will be featured in the next installment of best words, worst words. I was surprised at the ease with which Thomas chose his superlative words. No deliberation at all; they came right to him. Logically, obscurité (darkness, obscurity). Thomas believes that people cannot stand to live in obscurity – that they crave to be in the light, to be seen and known. Yet he also believes that people can’t live entirely in the light – that they need a small amount of obscurity to exist. I don’t usually think of light and darkness as aspects of the human condition, but leave it to a writer to bring the poetry. Or leave it to the French language, I suppose. Until I noticed that obscurité translates to both darkness and obscurity, I hadn’t really linked the two. 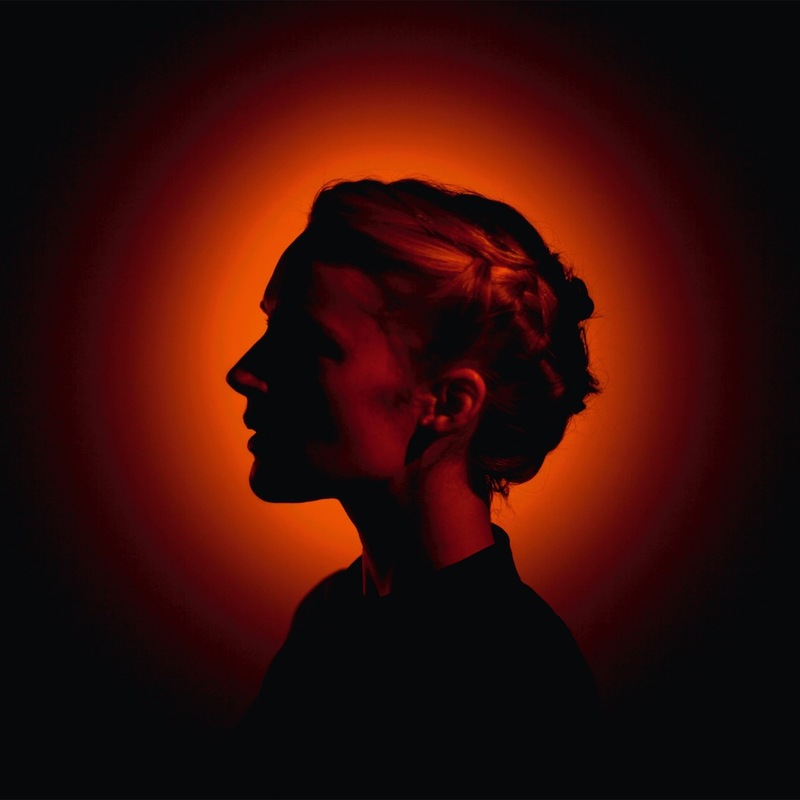 Darkness had always seemed physical and obscurity existential, but I suppose there is a lot of crossover – darkness can be existential and obscurity can be physical. I love these moments of lexical epiphany! 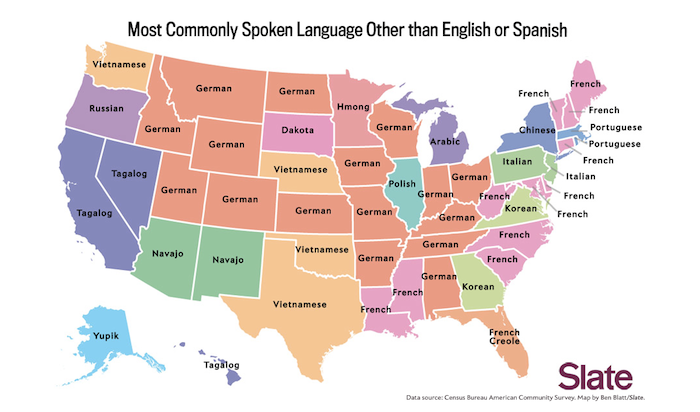 There are only seven states whose most common language other than English is not Spanish. 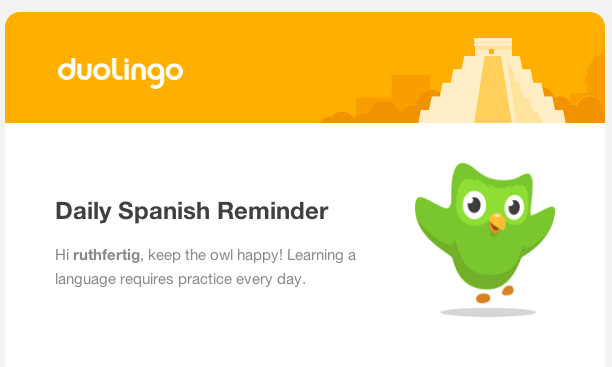 But when you take español out of the mix, things get a lot more interesting. And surprising, at least for me – I would have thought Chinese would show up more often, and German and French less. Last night instead of going to my weekly French Meetup, I wore the dress I had bought while putting off last week’s session, and I attended the premiere of a Hollywood movie featuring a perfectly Hollywood version of France. 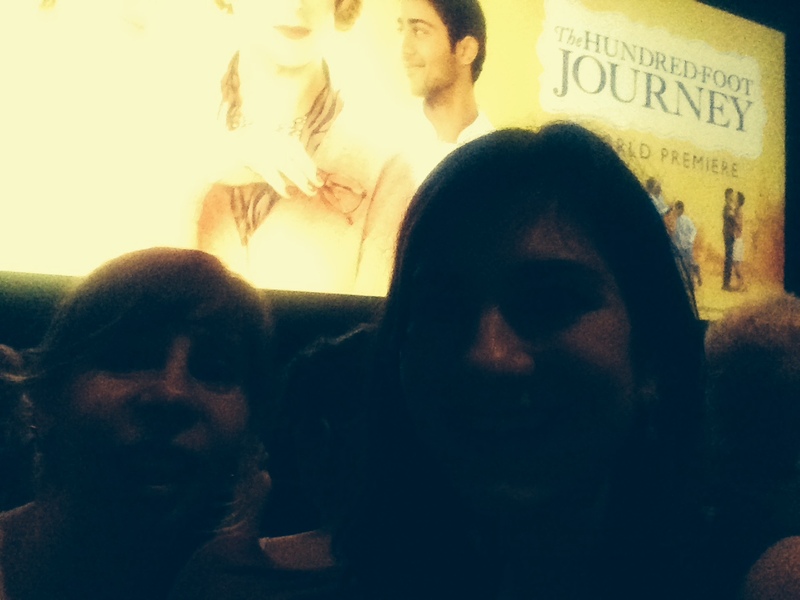 There were more clichés in “The Hundred-Foot Journey” then you could shake a stick at. Three of the most egregious: the quaint village untouched by modernity (not one cell phone or computer in sight, but plenty of vintage books and bicycles); the cozy whitewashed apartment illuminated only by candlelight; and the shy ingénue with saucer-like eyes and magnetic charm – a French twist on the manic pixie dream girl. But who cares. We dressed up, we walked (by) the red carpet, we spotted Oprah and Helen Mirren, and we were mildly entertained for two hours. 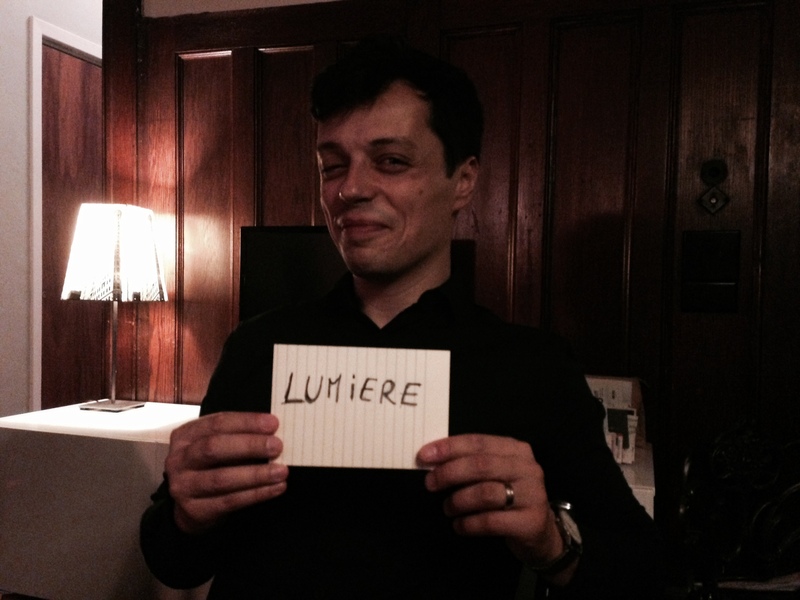 And I heard about six lines of French over the course of the movie – so I’m counting that as a de facto Meetup.